Mini Spy Video Camcorder Watch (4 GB) is rated 2.4 out of 5 by 8. 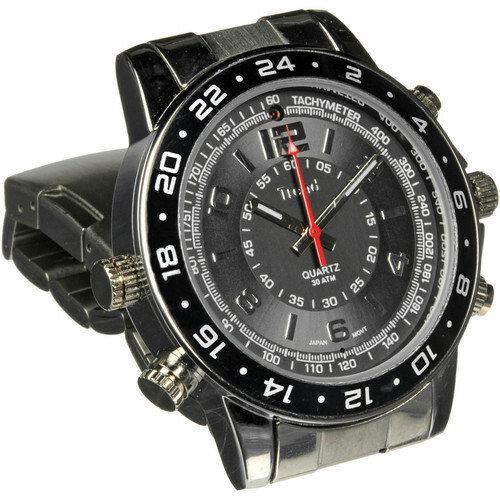 Rated 1 out of 5 by THE CUSTOMER from I WILL NOT BUY THE PRODUCT AGAIN THIS PRODUCT IS MADE IN CHINA AND BE CAREFUL IF ANYTHING WRONG WITH THE WATCH THE COMPANY WILL NOT REPAIR IT. I BOUGHT THE WATCH 11/28/12 AND I USED IT IN JANUARY 2013, THE USB SOCKET CAME OFF CALLED B&H STORE THEY TOLD ME CALL THE COMPANY AND I DID, I SENT IT FOR REPAIR AND THEN TWO WEEKS LATER I RECEIVED A CALL FROM VICTOR THAT THEY CANN'T REPAIR IT BUT I SHOULD CALL OR TAKE IT TO THE STORE BECAUSE THEY SOLD THE WATHCH TO ME. THEY GIVE ME LOT A RUNNING AROUND AND STILL NOT FIX. DON'T BUY THIS PRODUCT AND I CAN NOT RECOMMEND IT TO ANY BODY. Rated 2 out of 5 by PrivateEyes from Stay away from this one. It has good video quality. Camera is very un-noticable. But, the operation of it is very tricky, and you can't tell if it is recording or not. In addition, all of the buttons fell off of it within three months of normal wear. My biggest problem with it is the operation. You have to hold down a button for a few seconds, wait for a red light. Then push the button in again to start recording. But you do not know if it IS recording, you may have just truned it right back off. I have missed some very important things because of this. Oh, and the watch part quit working after about a week. Rated 1 out of 5 by Mike from returned in 1 day. Watch instructions for Chinese only. Couldn't get it to work, but I m not Chinese. Returned immediately and would not recommend. . Felt cheap. Rated 5 out of 5 by I dont have one from Good product, excellent for my needs I just bought my watch, it is easy to use, good image quality, just waiting to see if it lasts enought time without any failure. Rated 1 out of 5 by winwin from Doens't work well. Sounds like a swell idea but it wont play in my mac. picture quality is very poor for 2014. Rated 4 out of 5 by SAM from mini spy video watch TTH WATCH WORKS VERRY WELL. never got it to work. The disk provided does not go into MAC and I asked for link to software and never received a response from company. As I live in VA and bought from BHS in NYC I got NO help from them.Do not recommend.